Almost all of us are familiar with Maslow’s hierarchy of needs (Maslow, 1943). For something developed over 70 years ago, it’s absolutely brilliant, mostly because it proposes that in order to go one level higher, we need to fulfill the needs in the lower levels. One cannot self-actualize or in his words be ‘ultimately happy’ if esteem, love, safety and basic physiological needs are not met. 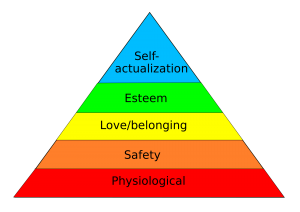 The impact of Maslow’s hierarchy of needs went much beyond academic circles and psychology literature. It changed the world by influencing the formation of Human Potential Movement in the 1960s and then arguably the development of an army of entrepreneurs, inventors and visionaries who made the pursuit of self-actualization as their life missions. Some of the icons behind the Silicon Valley of late 20th century and today were inspired directly and indirectly by Maslow’s model and the world owes him a great deal for how he envisioned our needs in this hierarchical manner. That there is a linear sequence in order to self-actualize. We must satisfy our other needs before addressing our need to self-actualize. One cannot truly self-actualize if he or she is struggling financially, feels unsafe, is unloved and lacks self-confidence. That the ultimate need of a human being is self-actualization. This model doesn’t state this explicitly but it’s screaming this notion just by the visual representation of it: self-actualization at the top of our needs and the ultimate source of motivation. That self-actualization is only possible and attainable by a few [super-humans] who surpass the hurdles and obstacles of fulfilling all their other needs. That “self” is the center of the world. We need to think about actualizing oneself in order to attain our highest potential. Let’s think about these! Is it really so? Do you agree with the implications and assumptions listed above? Or you too see the flaws of this system? We know that the our development can sometimes follow a nonlinear model. There are self-actualized people whose other needs are not met or they might be partially met. SELF might not be the center of the world. Many people don’t live just to maximize their self-interests and potentials. People can live and be happy by serving others or serving various causes or non-self-oriented missions. Let’s go back to the question at the top. Judging if Maslow was right or wrong is actually not the point. Pragmatically, the point is to consider whether this mindset is going to help people or organizations or is going to put them in a potentially dangerous trajectory. If the latter, why not considering other ways of looking at our needs and sources of motivation and to opt in for a more complex nonlinear yet closer-to-reality approach.